Abstract: The thesis presents a holistic overview of the dramatic, didactic, and allegorical possibilities presented by the figure of the Christian devil to Anglo-Saxon authors, poets, homilists, and translators. Certain narrative inconsistencies characteristically accompany the nebulous devil of early medieval narrative literature-he is simultaneously bound in hell and yet roaming the earth; he is at one point identified as the chief of demons, while at another point taken as a collective term for the totality of demons; he is a physical enemy to be encountered in the natural world, and yet a metaphoric emblem invoked as the principle of sin or evil. Such critical moments reveal the devil’s protean vitality as a literary symbol, which authors were free to manipulate in a variety of ways to create literary effect or even to encode cultural anxieties. The study covers Old English charm literature and Solomon and Saturn I, the translations of the reign of Alfred (especially Wærferth’s Dialogues and the Old English Bede), select vernacular prose homilies and saints’ lives (especially Ælfric and the Life of Margaret), and the major poetic corpus (Juliana, Elene, Andreas, and Guthlac A). Ultimately the thesis constructs an ontology of hagiographic demonology, that is, a means of reading saints’ lives that unpacks certain anxieties inscribed in narrative about the foundations of reality. 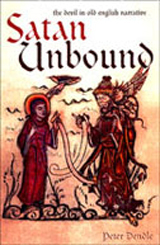 These texts are permeated by signals that the demonic is far less remote and weak than is openly asserted in these works or in the orthodox theology of the time; it is interesting to observe precisely how diverse authors attempt to confront or circumvent the implications of these signals. This study is an attempt to define and articulate the precise significance of the devil as a recurring character in Old English narrative literature. The devil is among the most frequently appearing characters in the corpus, reflecting a pervasive interest on the part of Old English authors, poets, and translators to sustain reified representations of evil as an integral component of mythological narrative, especially hagiography. Understanding the responses of Anglo-Saxons to the devil of the Latin source texts, as well as recognizing the innovative uses of the devil in original insular literature, allows us more fully to understand these enigmatic, and often quite alien, literary forms. It is a commonplace of Old English criticism that the devil instigates sin. It is curious, therefore, that no one has asked in any systematic or comprehensive manner exactly how the devil does this. I will offer a wide-ranging look at the various manifestations of the devil in an attempt to characterize the disparate attitudes toward his precise role in the initiation and progression of human sin. But it becomes immediately apparent that the devil does more than instigate sin: he performs a range of narrative and thematic functions that I will also attempt to illuminate.